The annual UN climate conference kicked off today in Lima, Peru, and over the next two weeks delegates from more than 190 countries will be seeking to build on the momentum created by the recent US-China bilateral agreement and efforts launched at September’s Climate Summit. Lima signals the bell lap in the current round of talks leading to a climate agreement in Paris next year. Countries won’t finalize an agreement in Lima, but they should make progress in setting out fundamental elements of such an agreement. No single UN agreement will solve climate change. What an agreement in Paris can do is to build a structure that spurs countries to be more ambitious, makes them accountable for their progress, and gives them the confidence that other countries are taking action as well. The talks in Lima can lay the groundwork for such an outcome. Last month’s pact between China and the United States to cut their national emissions demonstrated a positive new dynamic of bilateral cooperation between the world’s two largest emitting nations. The Climate Summit 2014 hosted in September by UN Secretary-General Ban Ki-moon served as the launch pad for broad commitments among governments, intergovernmental organizations, the private sector, and civil society to curtail climate change. The U.S. Environmental Protection Agency introduced in June the groundbreaking Clean Power Plan to reduce carbon dioxide emissions from the current fleet of U.S. power plants, which account for almost 40 percent of U.S. carbon emissions from energy. The state of California, now wrapping up the second year of its carbon market, has cut by 4% emissions covered by its cap while its gross domestic product has grown 2%. 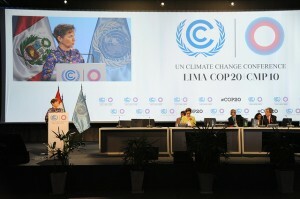 An important area for discussion in Lima concerns the framework that the 2015 agreement will put in place to support and promote ambitious actions by countries to address climate change. An effective framework will elaborate key integrity standards for transparency and environmental efficacy, create incentives for early emissions reductions before 2020, and facilitate the use of well-designed carbon markets to help nations take ambitious action to reduce emissions. Forest issues likely won’t provide headlines in Lima, after negotiators last year built on years of technical discussions and finalized the Warsaw Framework for REDD+ (Reducing Emissions from Deforestation and Forest Degradation). However, my colleague Chris Meyer says some forest issues will be up for discussion, including “Safeguard Information Systems” and how REDD+ goals might fit into REDD+ countries’ Intended Nationally Determined Contributions (INDCs). Read EDF’s full news release on Lima here: Lima UN climate conference focuses on 2015 Paris talks as countries take on foundational issues. This entry was posted in Deforestation, Lima (COP-20), News, REDD+, UN negotiations, United States. Bookmark the permalink. Trackbacks are closed, but you can post a comment.